Rick, November sun, Sunday morning, seventeenth hole. Last week, I spent a couple of days in Kansas City without my golf clubs. My mother told me about a local country club, which a few years ago assessed its members for major improvements to the golf course. The assessment was substantial, and quite a few members left the club rather than pay it. Four of my mother’s friends went to the club one day for their regular bridge game, and when lunch was over they discovered that none of them could sign the check. All four, it turned out, had dropped their membership without telling the others. Stanley on the second tee last Sunday, with his Crocodile Dundee hat (bought on eBay) and late-season club-carrier thing. This entry was posted in Scotland, Sunday Morning Group, Weather and tagged Bridge, Venn diagram by David Owen. Bookmark the permalink. Your Venn Diagram doesn’t make sense. 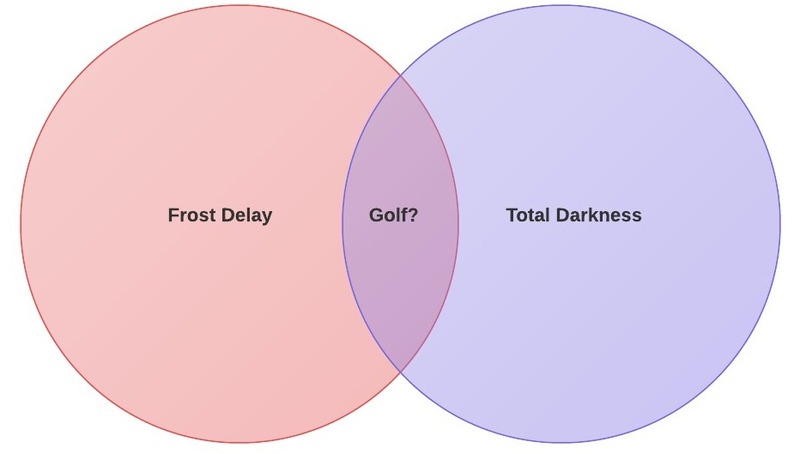 Shouldn’t “golf?” appear in the part of the rectangle where both “frost delay” and “total darkness” are absent? You have “golf?” in the part where they overlap, implying that only if we have both a frost delay and total darkness, is golf a possiblity.